The PH2-25ROF will support up to 2-3 major hot water functions in a warm climate, but is not recommended for installation in climates where freezing is possible. It can also be converted for commercial use up to 185°F with the simple addition of a hi-temp computer chip. High altitude capable up to 9,840ft. No programming chip required. 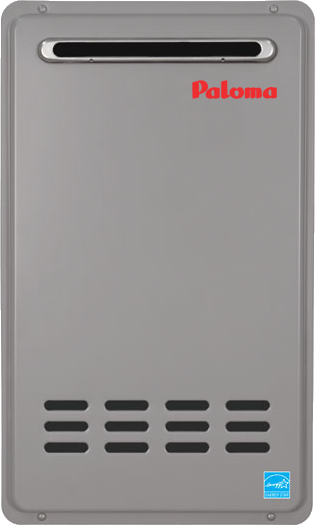 These Paloma/WaiWela residential Tankless Water Heaters are ENERGY STAR® qualified. Products with the ENERGY STAR® label are the most energy efficient choices you can make as a consumer. Paloma is a partner with ENERGY STAR®. ENERGY STAR® was developed by the US Environmental Protection Agency (EPA) and the US Department of Energy (DOE) to reduce energy use and air pollution by labeling energy-efficient, cost-saving products used in homes and offices. Products awarded the ENERGY STAR® label significantly enhance energy savings while providing a healthy environment. By participating in ENERGY STAR®, Paloma/WaiWela is helping to differentiate between standard-efficiency and high-efficiency products. Using these products helps you save money on your utility bills and works to protect the environment by conserving energy. Some models only qualify in specific matched systems. When you buy an ENERGY STAR® labeled tankless water heater from Paloma/WaiWela, you are acquiring a product that is in the top 25% for efficiency. Depending on the age of your existing equipment, you can save from 15%-40% on your utility bills by choosing an ENERGY STAR® qualified product from Paloma/WaiWela. For more information about ENERGY STAR®, visit their website at www.ENERGYSTAR.gov.